Almost 7 months has passed since I last blogged about the basement. Well, it was really a labor of love and a marathon. During the moving-back-in phase, we completed a few major finishing touches. Hubby and I had a boat load of experience installing IKEA kitchen cabinets (at least for the discontinued Akurum series) from the kitchen remodel several years ago. For the basement, we installed a bunch in the study and the family room. Per the previous post, I made my own countertop for the study. Once the countertop was complete, we moved onto installing the drawers and doors. The final frontier was an undercounter freezer. It took quite an effort to level the freezer because the entire basement floor is sloped towards the floor drain in the utility room. The other issue I ran into was the freezer door handle. The handle that came with the freezer is a piece of ugly plastic. I measured the distance between the preset holes on the door, searched online and found that a sliding glass door handle would fit. The piece I need is part of a package for the locking mechanism of a sliding glass door. It costs less than $20 so I took a chance on it and the black metal handle looks great. After more than 26 months of hard work, we are finally moving furniture back into the basement. That’s a major challenge all on its own. How’s everything going to fit? It will take another few more weeks to find out because we have a ton of stuff to move. What happened in the last few months? I installed over 100 feet of baseboards. During that process, I learned how to create coping joints in the inside corners of the baseboards with a miter saw, i.e. no coping saw required. It’s not difficult but it is definitely scary holding the baseboards and sticking my face super close to the miter saw. I am very thankful that I still have all ten fingers after getting intimate with power tools. 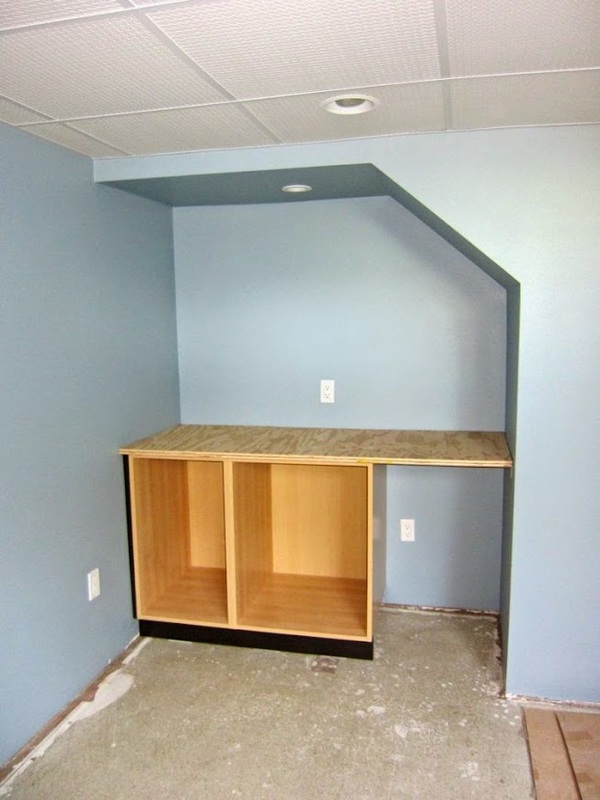 Once the baseboard challenge was mostly conquered, I turned my attention to the countertop in the study. We have a space under the stair landing that I had planned for IKEA kitchen cabinets and an undercounter freezer. The cabinets are something we are familiar with from the kitchen renovation. The countertop is another story. IKEA sells super affordable Formica countertops. Most people don’t like Formica in the kitchen but for the basement, the price is right for me. We measured the length of the three-sided enclosed space, cut the countertop and then realized there is no way a solid countertop will fit because the walls are not square and not straight either! It is kind of a parallelogram with a convex back wall. How did I figure that out? We used some scrap pieces of quarter inch plywood and hot glue to make a template similar to how the pros template for solid countertops. I spent months researching for plan B after installing some plywood in sections as the underlayment. The main criteria is that there will be no backsplash around the countertop. I hate the look of short backsplash around countertops. I want drywall meets countertop and that’s it. Tiles seem to be the way to go but I don’t want grout lines on a counter. I even considered epoxy countertop until I read about the step of using a blow torch to pop bubbles in the freshly poured epoxy. Wielding a blow torch near drywall doesn’t sound right to me. Has it been two years since we demoed the basement? We are getting there real soon. Hubby is not amused. But we have come so far! We passed the final permit inspection today. I mean this is IT. We got signed off on the line “Okay to Occupy” on the inspection record card. If we stop everything there is still to do, we can drag some furniture down there to get comfy. And yet, the ordeal is far from over. Let’s backtrack from the last blog post. After passing final inspections for electrical and mechanical, I got right back to work to finish plumbing. The IKEA sink and drain connections were quite a challenge. I figured it all out in 2 weekends. I spent two weekends installing the IKEA Odensvik sink and Godmorgon cabinet in the basement bathroom. It’s super tricky. I researched several postings online before starting the install. Several months have gone by since my last post. We are at the stages of finish work and it feels like this will take longer than the rough-in. Partly because this is when decisions have to be made for everything visible. We sampled 6-8 paint colors before deciding on two of them. Other finishes are decided by looking at internet photos which often give me much anxiety. What if I don’t like the items when I finally see them in person? Returning internet orders incurs shipping costs but not so for the ship-to-store option like Home Depot as long as it’s not a special order item. Otherwise, I clicked the button to say “buy” and crossed my fingers that everything will work out. One of such internet adventures was the ceiling grid and tiles for the family room and office space. We had contractors drywalled the ceiling in the bathroom but I want to keep the rest to be accessible for future upgrade of electrical or plumbing repair (a frozen spigot has already given us an important life lesson back in January). Traditional drop ceiling does not work well for the low ceiling height in basements so I did a lot of research on alternatives and decided on CeilingLink. This PVC product comes in a few different shapes to accommodate the room perimeter, stairway openings, and other box-arounds.